Years or decades from now, we might look back on two endorsements in 2015 and 2016 as signal moments in black book history, at least in the careers of Ta-Nehisi Coates and Colson Whitehead. When else have the appraisals of two black women been so prominent in the promotion of book by major black men writers? First in 2015, Toni Morrison offered a book blurb for Ta-Nehisi Coates's book Between the World and Me. While the book was already primed for success, the Morrison blurb became an integral part of the narrative about Coates and his work. "I've been wondering who might fill the intellectual void that plagued me after James Baldwin died," her blurb read in part. "Clearly it is Ta-Nehisi Coates." In the lead-up to the publication of his book, Coates had informed his publisher that he was typically uncomfortable with blurbs. There was one exception though. "My whole thing was," he said, "if Toni Morrison can't blurb it, then I don't want anyone to blurb it." As our most critically acclaimed writer, Morrison's assessment of Coates was crucial to enhancing, if not expanding his audience. That was 2015. 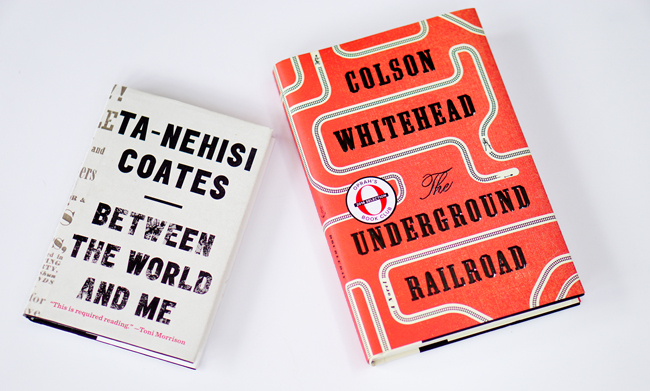 Now, a year later, we have Colson Whitehead's The Underground Railroad. The novel was originally scheduled for a September 13 release. However, at some point, someone at Doubleday got an advance reader copy of Whitehead's novel to Winfrey. What did she think? "This book took my breath away," she said in one of her enthusiastic appraisals, announcing The Underground Railroad as an Oprah Book Club selection. The Boston Globe reports that "Doubleday had planned an initial print run of 75,000 copies — the kind of robust figure typically associated with only the more popular literary fiction releases." However, after becoming aware that the book was an Oprah selection, the publisher decided to produce an initial run of 200,000 copies. And they decided to publish the book on August 2.